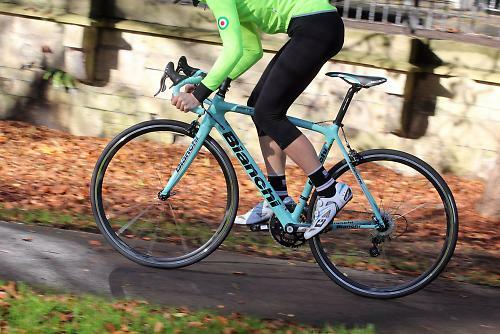 Sitting one rung below the range-topping Oltre XR2 in Bianchi's range, the Sempre Pro is a seriously capable bike for racing or simply riding fast, with much of the performance of the Oltre but with a far more wallet-friendly price tag. The geometry mirrors that of the Oltre XR2 so you get a similarly short head tube, providing a low front-end and ensuring an aggressive and aerodynamic position. That allows you to really push the Sempre Pro hard and fast through sweeping bends, over crests in the road and down swooping descents. It winds up to speed quickly with good stiffness through the frame, helped by the oversized down tube, PressFit30 bottom bracket and tapered head tube providing a very taut frame when pushing it close to the limits. It's stiff enough for the most demanding rider, but not so stiff that non-racers will be put off. It's not at all uncomfortable, despite the oversized 31.6mm seat tube - many manufacturers are adopting smaller 27.2mm seatposts as a way of boosting comfort - and on many road surfaces it settles down into a smooth patter at pace. It's not as silky smooth as the highly impressive Infinito CV when taking to rougher roads, but the gap between the two isn't as large as you might imagine. The short wheelbase keeps the handling nimble and it has an energetic, keen and flighty personality that quickly wins you over. You could easily race the Sempre Pro in a criterium or open road race, but it's also a fine sportive and distance bike if you aren't a fan of sportive bike geometry, which typically raises the front-end, lengthens the wheelbase and shortens the top tube. It's traditional race bike geometry then, but wrapped up in a bike that isn't limited to racing. 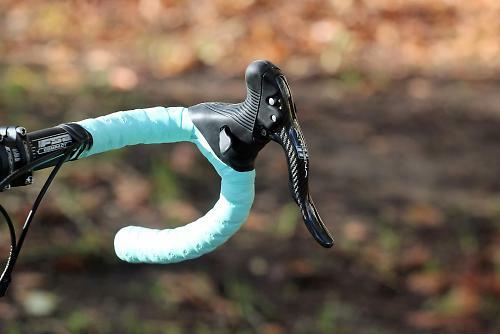 I'm a fan of Campagnolo components and of the ergonomic changes the Italian company have made to the thumb shifter; it's now pointing downwards, mimicking a change first introduced on their electronic groupset, EPS. Gear changes, whether in the hoods or on the drops, are much easier, and create a far more pleasant experience, and certainly has the capacity to win over even the staunchest Campagnolo critics. The Athena derailleurs offer an 11-speed setup with a 12-27 cassette marrying up to an FSA Gossamer 50/34 chainset providing a good spread of gears, which combined with the 7.93kg weight makes the Sempre Pro a decent climber. 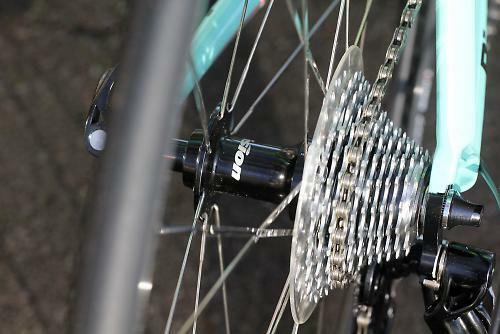 It's a shame not to see an Athena chainset however. 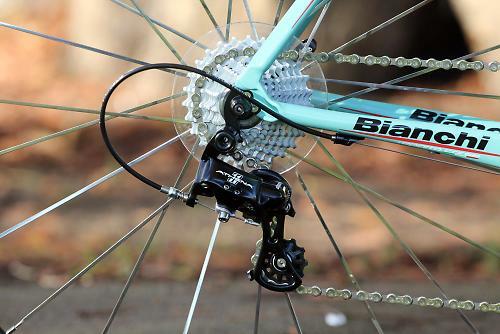 Similarly the FSA brake calipers produce good braking performance, but they are a noticeable measure taken by Bianchi to hit this £2,300 price. We're seeing more 25mm wide tyres fitted as standard to road bikes, even to bikes as racy as the Sempre Pro, so it's nice to see the Vittoria Zaffiro Pro Slick 25mm tyres. 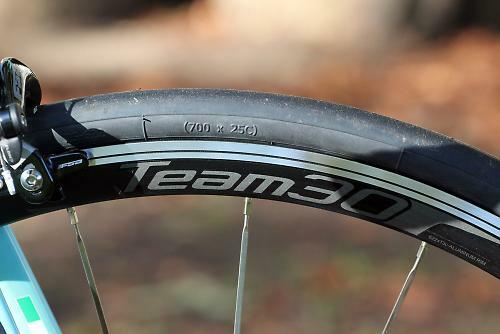 However, they measure closer to 24mm on the Vision Team30 rims, showing that rim width is more critical in attaining increased tyre width than merely fitting wider tyres to regular narrow rims. The Vision Team30 wheels feature CNC machined aluminium hubs laced with bladed spokes to 30mm deep aero rims with machined braking surfaces. There are 20 radially-arranged spokes in the front wheel and 24 in the rear, in an asymmetric 2:1 pattern. They weigh a claimed 1,770g for the pair and were perfectly competent and resilient throughout the test period, surviving the rough potholed roads in my small part of the world. The finishing kit is from FSA too. The compact Vero handlebar is a comfortable shape with easily accessible drops, and the generously padded San Marco saddle with cutaway channel was very comfortable even on the long haul. The only thing I had to change on the bike was the stem, and that was simply to fit a longer one to achieve my desired fit. The frame and fork are nicely shaped with well proportioned tube profiles, with a PressFit30 bottom bracket providing a large junction for the oversized down tube. 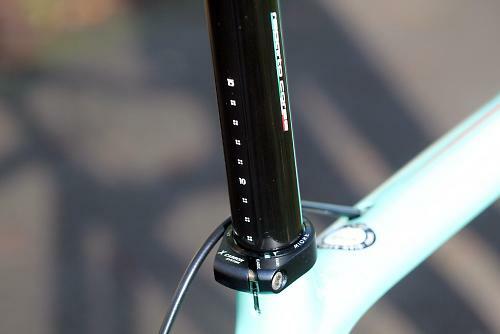 The head tube is similarly oversized with a tapered steerer tube on the fork. Providing just enough compliance to take the edge off rougher roads are the slim seat stays that join the seat tube with a wishbone. The frame is well matched with the slender fork which deals well with harsh roads and smoothes out the most offensive bumps and wrinkles in the tarmac. The frame has full internal cable routing for the mechanical groupset on this test bike, and it has the necessary drillings for an electronic groupset giving it upgrade potential. 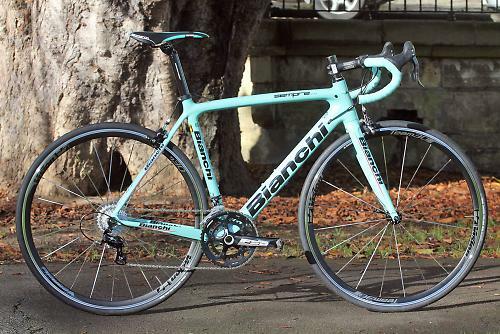 Bianchi claim a weight of 990g for a size 55cm frame which makes it competitive with bikes costing a fair whack more. 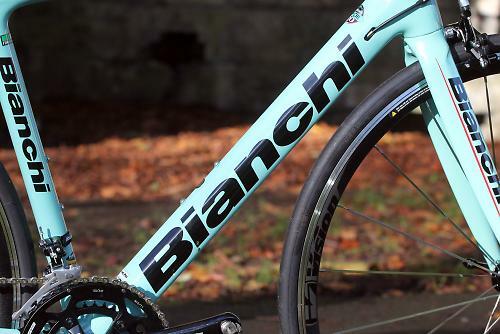 Of course it's painted in Bianchi's legendary Celeste blue finish, and it's without doubt a classy and elegant-looking bike. It won't be to everyone's taste - you'll know if you like or dislike it - but the general consensus among people who saw me riding the Sempre Pro was a thumbs up. It's certainly an emotive colour. 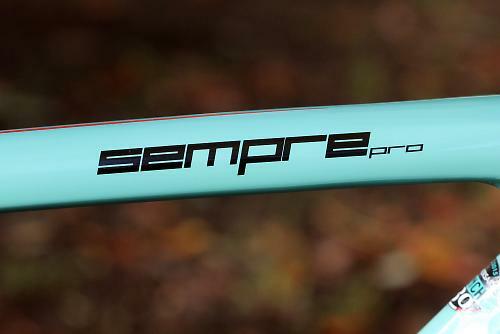 The Sempre Pro may lose out against better specced rivals at this price point but it offers a great ride that is comparable to bikes costing a lot more, with loads of potential for someone wanting to take up racing or simply as a very fast all-rounder, for sportives and weekend blasts. 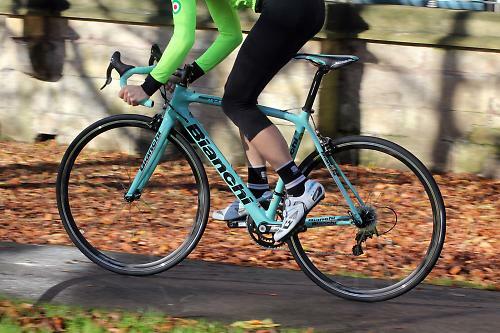 Bianchi's 130 year history, multiple race wins and the iconic colour will have a lot of sway with many cyclists too, a quality that's hard to put a price on. 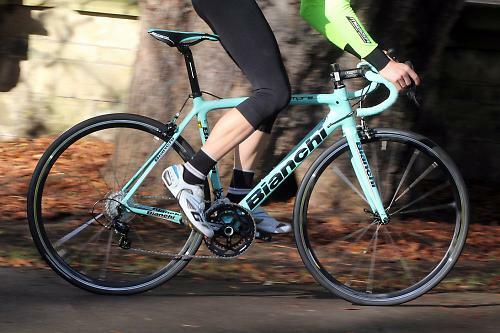 Engineered as a carbon monocoque design to combine rigidity and lightweight, featuring Bianchi's racing geometry. Versatility is the key to this bike; created to meet the needs of different types of riders. New big sections in important areas such as the down tube/head tube, 1.5" lower headset and bottom bracket for better rigidity and handling. 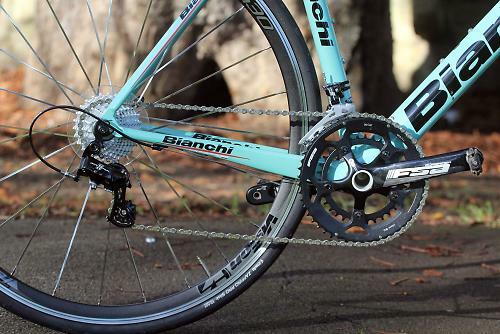 Oversized chain stays for direct power transmission. Double compatibility with both mechanical and electronic groups and internal cable routing finish off this design. Exemplary build quality and high finish. Full carbon fibre monocoque with "Carbon NanoTube" technology adding carbon to the resin to improve the strength to weight ratio. 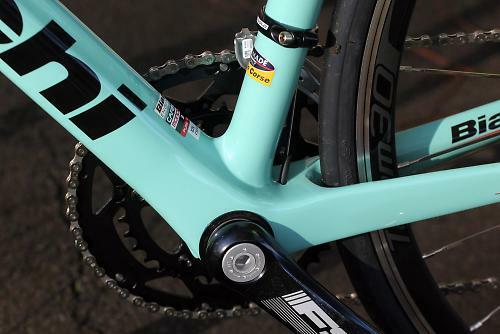 It's the same geometry as the top-end Oltre XR2. It's what is best described as an aggressive fit, with a 145mm head tube on the 55cm test bike ensuring a low front-end, perfect for racing and riding fast where aerodynamics matter. 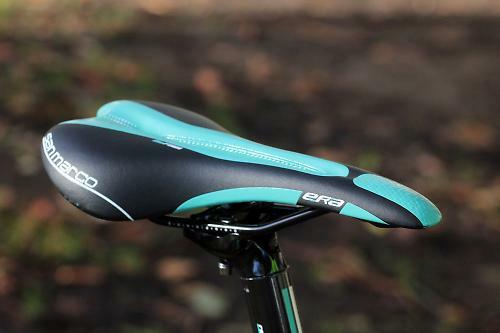 Not as comfortable as some, not as comfortable as Bianchi's own Infinito CV, but it's not a harsh ride, those slim seat stays help a lot. Taut through the front-end and bottom bracket. Very stiff but not overly so, a nice balance. Rewarding when you put the power down. How would you describe the steering? Was it lively, neutral or unresponsive? Agile and lively, a delight to ride. Lively and agile, very responsive, not the calmest bikes to ride but a lot of fun, full of fizz. The Vision wheels aren't the lightest but didn't blunt the performance too much, but some lighter and more aero wheels would be a good upgrade for untapping more of the Sempre Pro's performance. Shame not to see a full Athena groupset but the FSA cranks and brakes, in their defence, worked well. 25mm tyres are actually closer to 24mm because of the narrow width of the rim. Would you recommend the bike to a friend? If they wanted a bike that could be raced or ridden hard and fast, yes. That's how a Bianchi should look... All Celeste with simple decals. Nice to see they've gone back to the blue version of Celeste too. Completely agree, Jack, though I like the odd red Bianchi too, a bit like a yellow ferrari! I think my own Bianchi, a Sprint 28c (£135, Halfords, 1982ish) was one of the more green ones but had the same lightweight sticker headbadge as yours appears to have. It was the only bike in the shop without steel rims, iirc. Saw a beautiful silver Bianchi in Richmond Park today. Mine's Celeste though. Not exactly full internal routing given that the rear mech cable sits outside of the chain stay. Why didn't they just put inside like on most internal routing machines.